October 26, 2016 – Colorado Chautauqua Association kicked off its 2016-17 Chautauqua Space Series on Monday night, featuring some of Boulder’s most accomplished scientists. The sold-out public lecture was held at Chautauqua Community House and featured Dr. Vicky Hamilton, a planetary geologist at Southwest Research Institute in Boulder, Colorado. Hamilton is the deputy instrument scientist for the Thermal Emission Spectrometer (OTES) for NASA’s OSIRIS-REx (Origins, Spectral Interpretation, Resource Identification Security, Regolith Explorer) mission. She also leads the science team’s Spectral Analysis Working Group. OSIRIS-REx will be the first U.S. mission to orbit, sample and return a piece of an asteroid to Earth. The spacecraft was built by Lockheed Martin Space Systems in Littleton, Colorado, and launched from Kennedy Space Center on a ULA Atlas V rocket on September 8, 2016. It’s now traveling to asteroid Bennu, where it will map the asteroid before taking a pristine sample, which it will return to Earth in 2023. Hamilton’s specialty is in measuring the spectral properties of rocks and minerals, which tells scientists a lot about the composition of an asteroid, and the amount of heat energy coming off the surface. This heat energy is responsible for something called the “Yarkosvsky Effect”. As the asteroid is warmed by sunlight and re-emits thermal radiation in different directions as it rotates, the asymmetric thermal emission give Bennu a small, but steady push, slowly changing its orbit over time. Researchers need to understand the Yarkovsky effect to create more accurate models that can predict Bennu’s future orbit – and the orbits of other asteroids that are also likely to impact Earth. OSIRIS-REx will unlock clues to the origin and evolution of the solar system and its initial stages of planet formation. Information about the source of organic compounds found on Earth will also be gathered from this likely carbon-rich sample. After the sample is returned to Earth, it will be brought to Johnson Space Center to the same curation facility that received the Apollo samples. The entire sample will be catalogued and most will be stored for the future – when advances in technology can provide additional science data. The rest of the sample will be distributed to scientists and laboratories worldwide. 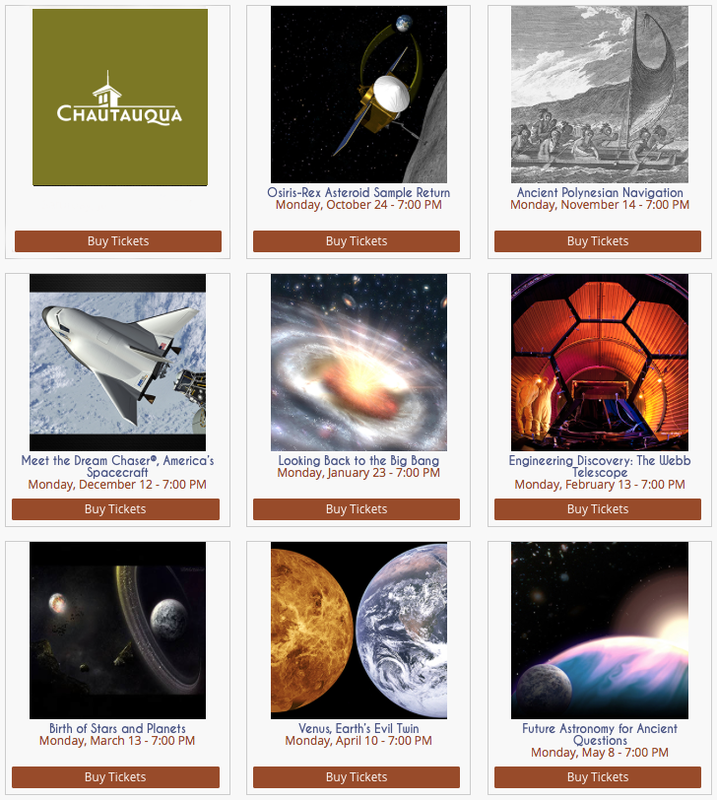 The Chautauqua Space Series is presented in collaboration with the University of Colorado. The public lectures feature Boulder scientists, astronomers, and engineers to explore current research and space missions. This popular series of talks has sold out for the current season.